Lots of markets, lack of time? Try a conditional search tool for BetFair! Whatever is your trading strategy on BetFair - scalping in-play horse races, betting on a tipster's choice, laying on next goal in soccer or anything else - the first thing to do is finding suitable markets and selections to bet on. BetFair has lots, and you may spend hours on just looking for your markets before you actually start trading. That’s when you definitely need BetFair automation software to do it for you. 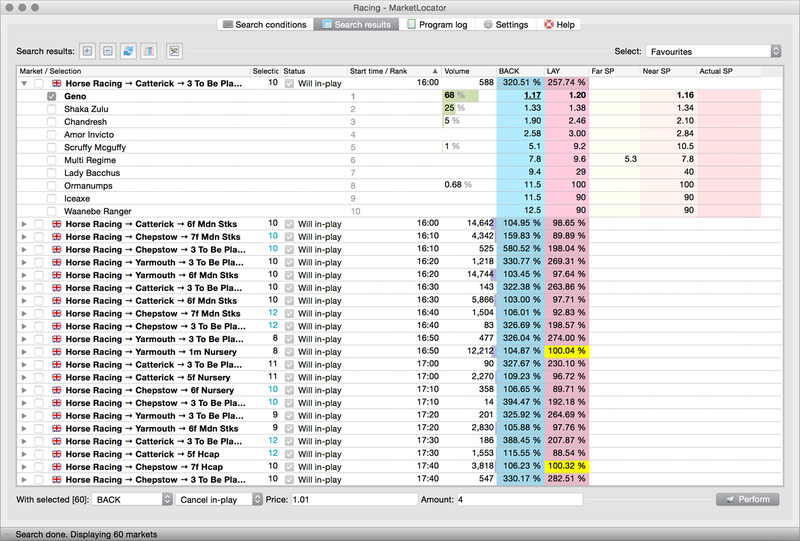 Execute a search among all BetFair markets filtering them out with a set of conditions you define. and Favourite's back price is between 1.2 and 4. You can check almost any market's parameter, and add unlimited conditions. Save this set of conditions for the next time you want to search new markets. Show found markets and selections in a neat table with an ability to sort by parameters, to select frequently used types of selections (Favourite, The Draw, etc. ), refresh all prices at once. 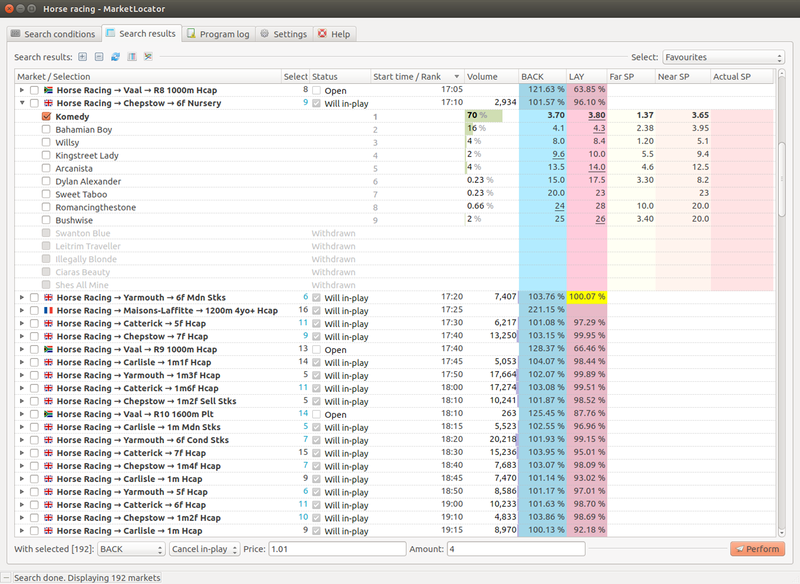 You can adjust the table view in the program settings. Your can export chosen selections to a file (xml, text, csv) for use in a different piece of software. Or, better still, to send them to your clients if you are a tipster. You can place a bet on each chosen selection if your strategy is about simple betting. You can even send an e-mail with chosen selections. MarketLocator supports 2-factor authentication. It also allows you to work through a proxy (crucial if your Internet Service Provider banned BetFair). The program has a multilingual interface (English and Russian). You can run MarketLocator on several OS (Windows, Mac Os or Linux). WellDone Creative Software is the leading BetFair bots developing company. The software passed BetFair security check and was approved by their techs. Software activation required. 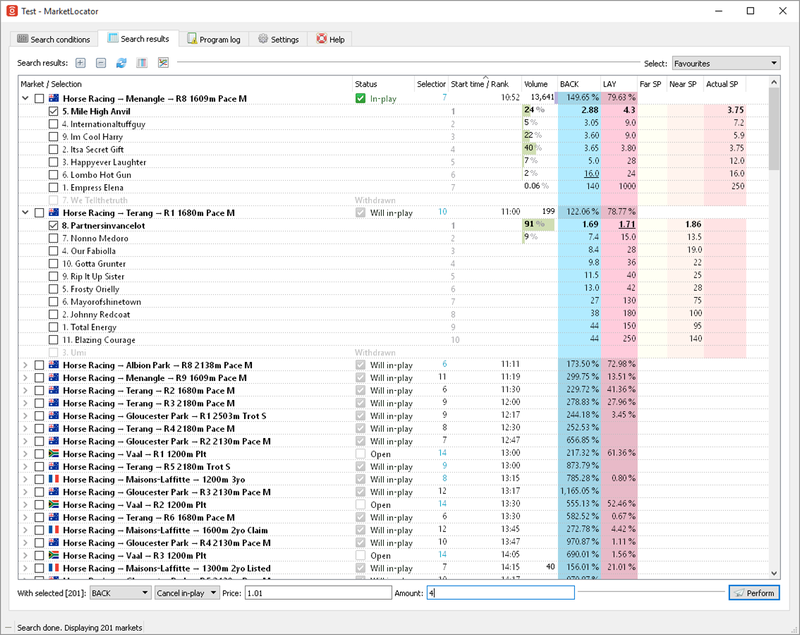 Try MarketFeeder Pro - market search, one-click betting, different market views, ladder, charts, automated triggered betting based on your conditions.